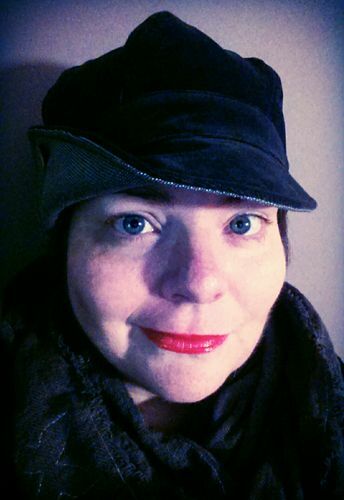 Newsboy cap and infinity scarf both purchased from sellers on Etsy. This is my favorite hat of all my hats. I would call it my top hat, but that would be very confusing. I've written before a bit about accessories, and how, for me, they've always been a way for me to express my personality, even when I wasn't confident enough to wear anything—or couldn't find anything—besides dark, shapeless clothes. I love hats almost as much as a I love shoes, and I am always keen to rock a cute hat. I never owned or wore scarves, except my winter scarf, until last year. My friend Ari has terrific taste in scarves, and always seems to find interesting ways to wear them. She has one slate grey infinity scarf I have always loved, so finally I bought one for myself. I don't think it works for me as well as she makes her scarves work, but I love to wear it nonetheless! Anyway. As always, this is a general thread for fat fashion, but, if you need a topic: Do you wear hats? If so, what's your favorite kind of hat? What is your position on scarves? Something something accessories!